The Commonwealth of Australia came of age as a country in the Twentieth Century. Australian forces had proven themselves in the First World War in numerous engagements, from the brutal stalemate of Gallipoli to their hard charging success in the Middle East. Australia was a growing, thriving country that fit in well with the British Empire. All serious people understood that this was essential for Australia in terms of national defense. With a small population it had an army of less than 100,000 men, a navy which could boast no larger warships than two cruisers and an air force of less than 300, mostly outdated, airplanes. The Australian armed forces, with their courage and rugged resilience, could hit above their weight but there was no realistic way the country could stand alone against the potential threats they faced. The most immediate threat faced by Australia was the Empire of Japan and this was understood well before the outbreak of war. Japan was the only country in the region that had naval and air forces capable of attacking Australia and it had the manpower available to have Australia totally outmatched. This disparity was the reason why Australia was most reluctant to see the Anglo-Japanese alliance come to an end in 1921. It improved relations with the United States but the Americans would make no promises to defend Australia or any part of the British Empire in case of attack and so the Australians preferred to maintain the alliance with Japan at least until Australian military strength could be increased to a level that would give Japan pause should the “Land of the Rising Sun” turn hostile. This, however, was not to be and the alliance was terminated which necessitated Australia holding closely to Great Britain and the rest of the empire as the country would have to depend on the Royal Navy to be their shield against a possible Japanese attack. Later, anti-British elements in Australia would pour scorn on this policy but it was, putting history and sentiment aside, the only sensible thing for Australia to do. Thus, as concerned events in Europe, whatever action or inaction the British government took, they could count on Australia’s full support. When war broke out over the German invasion of Poland in 1939 there was no debate, if Britain was at war with Germany then Australia was as well. Naturally, Australia was concerned about their own security given that Japan was part of the Axis but, in what turned out to be a major and costly mistake for Great Britain, the leadership in London assured Australia that there was no real danger of war with Japan. Australian forces were mobilized for action on the continent of Europe but the German conquest of France was so swift that the British had been forced to pull out before the Australians arrived. Still, their presence was felt soon enough as Australian pilots gave good service in the Battle of Britain and ships of the Royal Australian Navy scored several successes in the Mediterranean against the Italians. 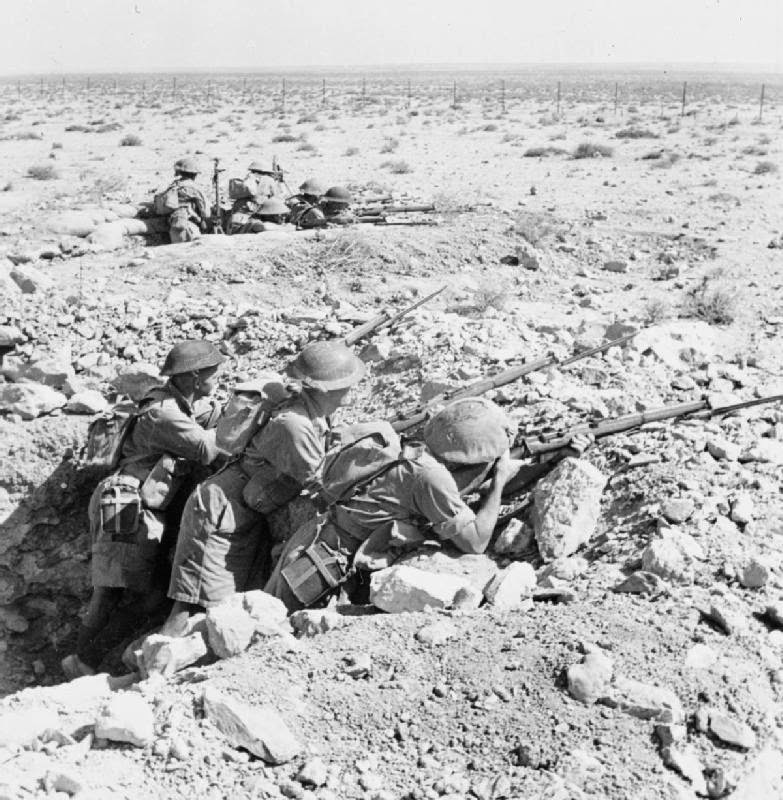 Australian troops first saw major action in the extremely successful Operation Compass in North Africa which drove the Italians out of Egypt and deep into Libya. Although often outnumbered, the Australians were backed up by British tanks and artillery that the Italians had no answer for and the Australian troops won a string of victories in North Africa in 1941. Their most important prize was the capture of the port city of Tobruk along with 25,000 Italian prisoners in January. But the British offensive was stopped and the situation changed dramatically with the arrival of the German “Afrika Korps” under General Erwin Rommel. Rightly guessing his enemy to be tired and over-stretched, Rommel threw caution to the wind and launched an immediate counter-offensive that drove the Allied forces back. However, the Australians proved their worth in what must be remembered as one of the proudest pages in Australian military history. Rommel was determined to take Tobruk and the garrison that defended it was largely Australian, commanded first by Australian General Sir Leslie Morshead, a tough, strict, no-nonsense general who would win more than his share of victories in World War II. Asked to hold Tobruk for two months, the hard fighting Australians held on for the better part of seven until November of 1941 when the siege was lifted, withstanding numerous, ferocious assaults by German and Italian forces. The Royal Australian Navy too played an important part in the gallant defense of Tobruk by ferrying supplies to the embattled garrison in spite of heavy attacks by Italo-German naval and air forces. The fighting was fierce and the sacrifices were great but the Australians held the port, taking everything that Rommel threw at them and earned the status of heroes. Australian forces would serve with distinction throughout the North African campaign but, of course, by the end of 1941 there was a new and more immediate enemy to worry about when after the first week of December 1941 the Empire of Japan launched attacks on Hawaii, the Philippines, Hong Kong, Singapore and Malaysia where many Australian troops were stationed. Because of the focus on the war in Europe, where the British were fighting for their lives, the British Empire was militarily weak in East Asia. To put it another way, they were focused on defending the front door from Germany and Italy when the back door was kicked in by Japan. Still, despite having few forces available and being largely unprepared, Australian forces fought as hard as their countrymen in Europe and North Africa. In the swift and stunning onslaught by Japanese forces under General Yamashita in Malaysia it was the Australians who were brought in after the Indian forces were decimated on the Slim River. At Johor, with their backs to the wall of fortress Singapore, the hard-fighting Australians brought the Japanese to a halt, inflicting heavy casualties on the enemy. Unable to break the Australians, the Japanese were forced to flank them with an amphibious landing. Breaking through the Indian forces holding that line, the Australians finally had to pull back. Singapore was the linchpin of British military strategy in the region and it was a shock to the world when the vital port city surrendered to a Japanese army that was much smaller and almost out of ammunition. Almost 15,000 Australians were among those British Imperial forces who became prisoners of the Japanese, representing about 25% of all Australian forces serving overseas. It was a terrible blow that Churchill himself lamented as the worst disaster in British military history. Those taken prisoner would suffer immense hardships and often cruelty. Thousands of Australians would not survive captivity, dying from disease, starvation, brutal treatment or outright execution. With a death rate some seven times that of prisoners held by Germany or Italy, it was something Australians would never forget. Yet, more setbacks were in store as the Japanese swept across Southeast Asia and the Pacific. An early target was Rabaul in New Britain off Papua New Guinea (itself an Australian possession at the time). Reinforcements couldn’t reach Rabaul and the garrison was forced to surrender. Many were executed by the Japanese and many more were killed when the ship they were on was torpedoed by a U.S. submarine. Rabaul then became a major base for Japanese forces in the South Pacific. In the Dutch East Indies (present-day Indonesia) Australian forces were sent to reinforce the small Dutch colonial army but it was an almost hopeless enterprise from the start. Japanese victories at sea meant that island garrisons were cut off and even if not defeated outright would have to surrender eventually. Yet, some did not as on Timor where the Australians waged a guerilla war against the Japanese for a year. 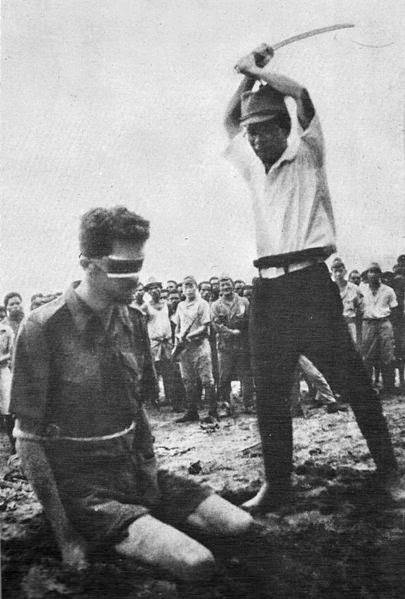 Others who did surrender often met a grisly fate as over 300 Australian prisoners of war were massacred by the Japanese in a series of mass killings in February of 1942. Eventually, almost all of the East Indies fell to Japan and there was a massive buildup of military forces in Australia as fears grew of a Japanese attack. Such fears were not hysteria as there was a Japanese proposal for an invasion of Australia. However, it was never adopted and while there was a more realistic plan for a strike southward to sever the shipping lanes between Australia and America this plan was dropped in favor of Admiral Yamamoto’s campaign aimed at the island of Midway. As we know, the Battle of Midway was a disaster for Japan and represented a turning point in the Pacific War after which, almost without exception, Japanese forces suffered one defeat after another. Prior to the fall of the Philippines, U.S. General Douglas MacArthur arrived in Australia to take command of all Allied forces in the southwest Pacific. This was a major turning point for Australia as the government, for the first time, turned to look toward the United States as a strategic defense partner rather than Great Britain. That policy has remained in place from 1942 until the present day. Australia was a huge and vital staging ground for Allied operations in World War II with over a million American troops passing through the country. Australia supplied a great deal of the resources necessary for the war and along with Australian military personnel, Australian civilians at home and on other islands in the vicinity often gave invaluable service as observers in coastal areas, keeping watch and informing the Allied command of Japanese movements. Unlike the experience of those Australians serving in North Africa against the Germans and Italians, where a measure of chivalry still lingered, what those in the east were fighting was no “Gentleman’s War”. As American and Australian forces went on the offensive in New Guinea, more Australian forces were massacred after surrendering by the Japanese and, as a result, the Australians generally stopped giving any quarter to the enemy which, in any event, was often not requested anyway. After being defeated on Guadalcanal, Japanese forces began to pull back to New Guinea but Australian and American air power devastated their forces at the Battle of the Bismarck Sea. It was one more step in the turning tide as American and Australian forces began driving the Japanese out of New Guinea, striking rapidly while bypassing stronger points that would wither away in isolation. From about the middle of 1943 onward it was the Australian and other Allied forces that were on the advance throughout New Guinea though the fighting was fierce and the conditions brutal for the troops on both sides. At home, while in no danger from invasion, Australia was certainly not immune from attack. 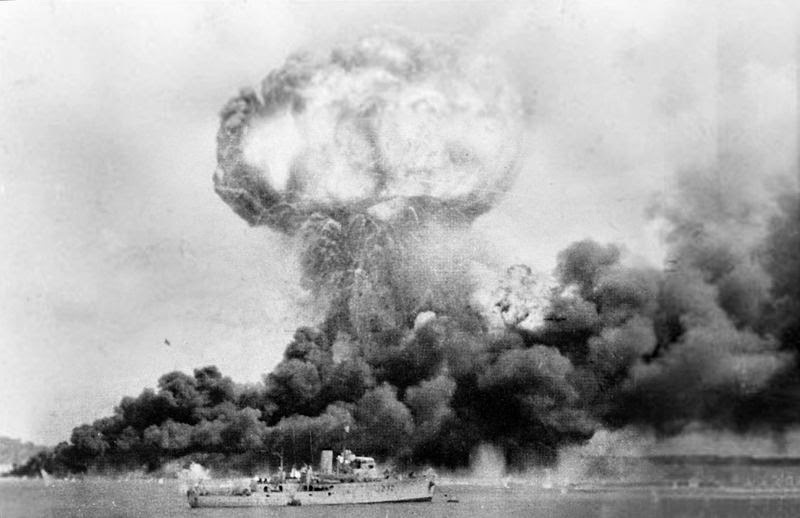 Starting in February of 1942 the Japanese launched air attacks on the northern port of Darwin, putting it out of action and killing some 235 people. Periodic Japanese bombing attacks on northern Australia continued throughout the rest of the year and most of 1943. Fortunately, Japan did not have sufficient aircraft or available nearby bases for these to do much serious damage. And, there were also attacks from the sea to worry about. Several German raiders and one German U-Boat operated in Australian waters during the war and Japanese submarines sunk a number of ships around Australia. In May of 1942 three Japanese midget-submarines infiltrated Sidney harbor to attack Allied ships. Two were detected and destroyed before they could make their attack but a third managed to sink a converted ferry before it too was lost. The operation had been a failure but it made the point that even Sidney was not immune from attack. In the naval fight it was fortunate that the Japanese did not use their submarines to best advantage but still, some managed to do quite a bit of damage, none more so than the I-21 which sank 45,000 tons of Allied shipping in Australian waters. Whether close to home or on the other side of the world the Royal Australian Navy gave good service against the navies of Germany, Italy and Japan. Starting in 1944, the Australian military contribution to the war effort began to be downsized. 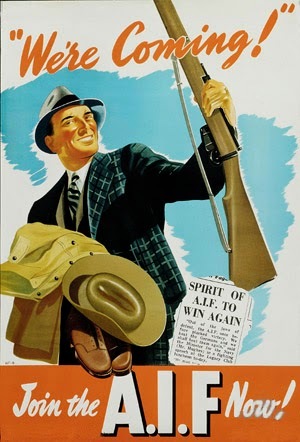 For a country with so small a population, it was already trying to do too much and the British and American leadership agreed that Australia would be of more help putting more men back to work on the home front to support the war effort of the other Allies, particularly the United States, which had more than sufficient numbers of men and machines to carry on the fight. Still, the remaining Australian forces played an important part in re-taking New Guinea, liberating the Philippines and in such naval battles as Leyte Gulf which practically destroyed the Imperial Japanese Navy as an effective fighting force forever. Australian personnel also played an important part in driving the Japanese out of the Dutch East Indies, the Bismarck Archipelago and the Solomon Islands. From the Greek islands and Libya to Iran to the Philippines, the Australians fought with equal tenacity all over the world. Australian military leaders were even organizing their contribution to the planned invasion of Japan which thankfully proved unnecessary. 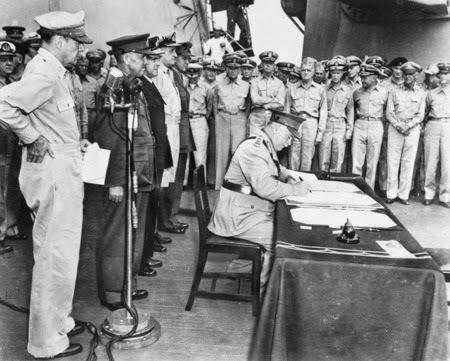 At the very end, as the Allies accepted the Japanese surrender on the deck of the battleship USS Missouri in Tokyo Bay, it was General (later Field Marshal) Sir Thomas Blamey, victorious commander of several operations in the New Guinea campaign, who signed on behalf of the Commonwealth of Australia. The Australians had fought long and hard in World War II and paid a heavy price. In the fighting against Axis forces in Europe and Africa the Australians lost a little over 9,500 men killed and about as many wounded. Against the Japanese the Australians lost about 17,500 killed and 14,000 wounded. About 8,000 Australians were captured by German and Italian forces, mostly in Greece or as a result of being shot down in the air war. Most were relatively well treated in accordance with the Geneva Conventions. The largest number, over 21,000, were captured by the Japanese, mostly in the early part of the war. Unlike their countrymen in Europe, only about 14,000 of these men survived their captivity. Almost half of the total number of Australians who lost their lives in the Pacific War died after being taken prisoner rather than in battle. World War II affected Australia as no other conflict ever had. 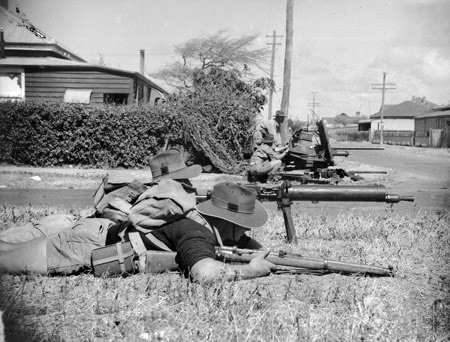 From the burning sands of Tobruk to the steamy jungles of New Guinea the Royal Australian Armed forces had earned a reputation for determined defense and courageous attacks. 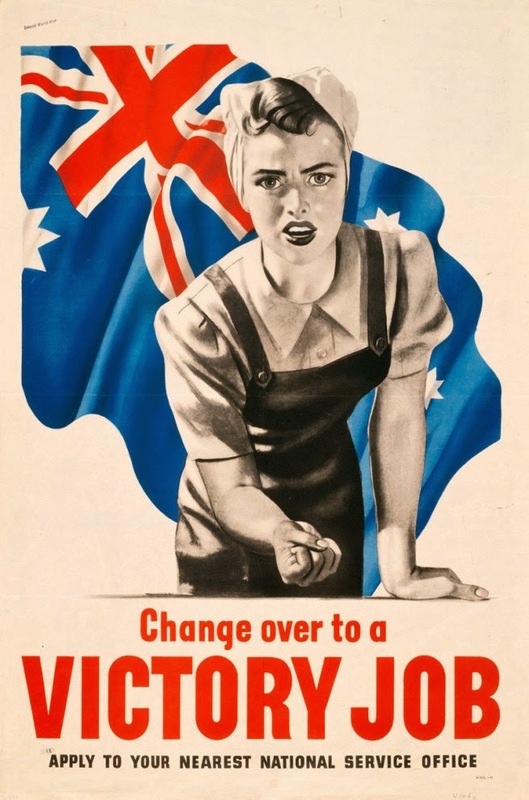 Industrial growth was spurred by war production at home, a greater interest was taken in world affairs and Australian security policy shifted from alignment with Britain toward alignment with the United States. There was also a move to grow the Australian population by encouraging immigration. Some of these changes worked out for the best, others did not, however, good and bad alike, the Second World War had a huge impact on Australia and for a country of its size, the Australian contribution proved decisive in several areas to the ultimate Allied victory. From an Australian with a keen interest in history, this is a good article and review of Australia's involvement in WW2. Firstly, I would just comment that you have misspelt 'Sidney' a couple of times. Also, I would comment that you could have said a little more about the changeover from Australia's involvement in the European/North African front vs. the Pacific war. Australia continued to have major ground forces (9th Division) in North Africa until November 1942 (Battle of El Alamein), ironically during the period when the threat to Australia from the Japanese was at its height. This represented around one quarter of the regular troops available at that time. 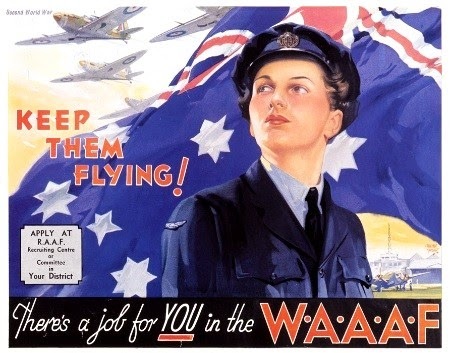 Additionally, RAAF squadrons (especially within Bomber Command) continued to operate in substantial numbers in the European theatre until the end of the war in Europe. Typically, these deployments were complicated by all sorts of political considerations.